The Legend of Tarzan is fun and a great contemporary reimagining of a silver screen legend. After the success of Disney's 1999 animated hit film Tarzan, it was only a matter of time before another live action film was made about the "King of The Jungle". After a long development process and a few different directors, David Yates of Harry Potter fame, along with Warner Bros., brought the legend to life again this summer on the silver screen in The Legend of Tarzan. Now, a couple of months later, The Legend of Tarzan is now coming home for new audiences to discover for the first time, as well as fans to enjoy a second, while viewing in the privacy of their own home. John Clayton III, aka Tarzan (Alexander Skarsgård; True Blood), has left the jungle behind and is now living as a Lord in London with his bride, Jane (Margot Robbie; Suicide Squad). When asked by Parliament, as well as the brash American, George Washington Williams (Samuel L. Jackson; Miss Peregrine's Home for Peculiar Children), to return to the Congo, he reluctantly obliges. However, unbeknownst to him, Belgian Captain Leon Rom (Christoph Waltz; Spectre) has other plans for him…to return him to an old enemy, Chief Mbonga (Djimon Hounsou; Furious 7). Alexander Skarsgård was born to play this role. His portrayal of Tarzan is spot on. From his physical appearance (showcased nicely in the Blu-ray's special features) to his acting, it is one of the best depictions of this famous character to date. Margot Robbie does an adequate job as Jane; however, she is, unfortunately, underused and could have been so much more had the script and Yates let her loose. Samuel L. Jackson, is well… Samuel L. Jackson, and Christoph Waltz is extremely believable as the cunning Leon Rom, whose wit is a perfect match for the "Lord of The Apes". Complimenting the great actors in the film is a great script by Adam Cozad (Jack Ryan: Shadow Recruit) and Craig Brewer (Footloose) and amazing cinematography by Henry Braham (Guardians of the Galaxy Vol. 2) that truly shows the beauty of the dark continent, as well as the skills of Director David Yates, who uses all the tricks he learned from Harry Potter and applies them to this film. As is usually the case with Warner Bros. transfers, The Legend of Tarzan is simply beautiful to watch. Presented in 2160p resolution with a aspect ratio 2.40:1 the home of Tarzan has never looked so beautiful. The jungle itself literally pops off the screen. The depth of field and color reproduction of the jungle is more realistic than any other 4k transfer of the past. The color palette chosen by David Yates is a bit muted, but is almost an exact reproduction on what it was on the silver screen. Mist almost seems to float off the screen. Black levels are spot on, and there is almost no noise or artifacting to be found in the transfer. The Dolby Atmos audio soundtrack complements this amazing video quite well. Dialog is crisp and clear, while the special effects envelope the entire room. The height speakers are mixed quite well and nicely showcased during some of the climatic scenes in the film. 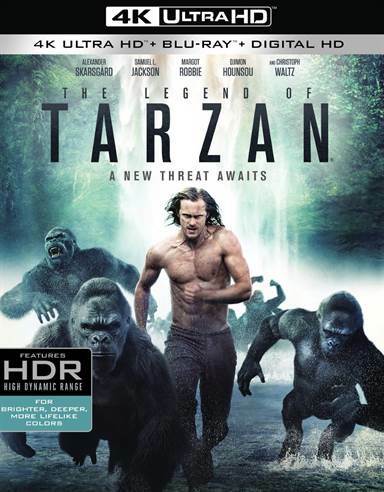 Hopefully The Legend of Tarzan will do well enough in home entertainment sales to have Warner Bros. reconsider their decision about stopping a sequel to this budding new take on the franchise. The Legend of Tarzan is fun and a great contemporary reimagining of a silver screen legend. It is a nice, refreshing change of pace to see an action film that does not focus on a superhero in tights and, hopefully, it will be a trend that will continue in the future. Download The Legend of Tarzan from the iTunes Store in Digial HD. For more information about The Legend of Tarzan visit the FlickDirect Movie Database.